Cranberry and grape, blueberry fruit known as super fruit the in North American.Cranberry has been a tradition healthy food in North America. The past 20 years, a series of scientific studies confirmed the health effects of cranberry.So, Can cranberry extract be applied to skin care products ? Cranberries are rich in vitamin A, vitamin C, vitamin E, anthocyanin, hippuric acid, catechins , Vacciniin, etc,Has a good antioxidant, antimicrobial and purification efficiency.Especially cranberry extract contains proanthocyanidins, also known as proanthocyanidins or condensed tannins.The bacteria can not be attached in the growth of the human body, thereby reducing the probability of infection in human.Proanthocyanidins are rarely in other fruit and vegetable ingredients. European called proanthocyanidins as nutritional supplements, skin vitamins, oral cosmetics. Because it can restore the vitality of collagen, making skin smooth and elastic. Collagen is the basic constituent of the skin, And Is colloidal substance make our body as a whole.Vitamin C is necessary for collagen synthesis and biochemical nutrition. Proanthocyanidins make vitamin C more effective, which means that the vitamin C can be more easily to complete all its features (including collagen production). Proanthocyanidins connected collagen, can prevent the destruction of collagen harming those enzymes. Proanthocyanidins not only helps collagen fibers form a crosslinked structure, but also can help restore over cross-linking caused by free radical damage.Excessive crosslinking causes suffocation and hardening of connective tissue, so that the skin wrinkles and premature aging. Anthocyanins also protect the body from sun damage and promote a cure for psoriasis and Shou spots. Proanthocyanidins is also an excellent additive for topical application of skin cream. 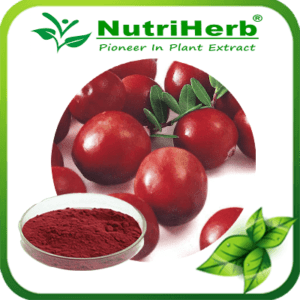 NutriHerb team reminds cranberry extract can be done in addition to skin care products, it also has a softening blood vessels, improve vision; treatment of diabetes, anti-cancer effect.